Nutrition is everything…the fuel for your body and the foundation of your athletic development. Our definition of fitness is the increased work capacity across broad time, modal and age domains. These are the main concepts I want to hammer home over the next 8 week challenge. To be clear: this will be a workout challenge first and a Paleo challenge second. In order to win, you will need to increase your work capacity more than your fellow competitors. The key to your success will be your nutrition. In case you haven’t attended our CrossFit 201, there are two main concepts at work within the nutrition realm: quantity (zone) and quality (paleo). For our purposes, we will be focusing primarly on the quality, but the quantity must be addressed in order to see optimal results! There is a lot of information below, so feel free to print out this post and study the content over the next week. Please ask any questions you have. Thanks for participating! 1. Take a picture of yourself with little to no clothes on. This is for your own personal motivation and will not be for anyone other than yourself (who you are doing this for anyway). 2. Sign up on the whiteboard and pay a $10 entry fee. More people means more winnings! 3. Perform the prescribed WOD (to be released shortly) within the first week and the last week of the challenge. 1. 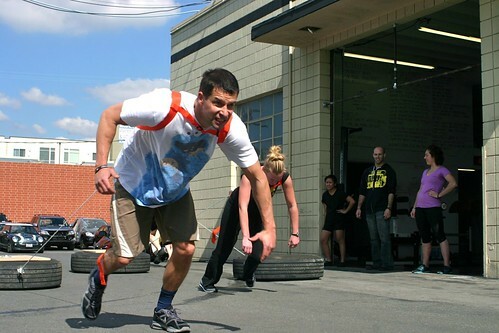 Attend the next CrossFit 201 class (March 20th)! The following information will make a whole lot more sense if you do! The Paleo basics are outlined at the bottom of this post and the Zone information is in this article. Read everything you can. Knowledge is power! 2. Keep track of what you eat! The PCF Nutrition Blog will have a counter for days into the challenge. We would love for you to post what you have eaten that day, Paleo foods you have discovered, questions and/or problems you are having. 3. Balance your meals! Success is not as simple as only what not to eat, but how much. Follow this simple rule with every meal and you will be ahead of the game: one third of your plate is protein, two thirds of your plate are veggies with a little bit of good fat tossed in there (see Zone article above for suggestions of good fats). 4. Beware the fruit! For those looking to lose weight, I would highly recommend cutting back on the fruit intake and getting more of your carbs from veggies. For those that are zoning strictly, and use the fruit to get those extra carb blocks, you can substitute 3 to 5 blocks of fat for one block of carbohydrate (depending on the individual). 1. Eat real food – meat, fish, eggs, tons of vegetables, some fruit, and plenty of good fats. Eat foods with very few ingredients, all pronounceable ingredients, or better yet, no ingredients listed at all because they’re natural and unprocessed. 2. Omitting all of these foods and beverages will help you regain your healthy metabolism, reduce systemic inflammation, and help you discover how these foods are truly impacting your health, fitness and quality of life. 3. Do not consume added sugar of any kind, real or artificial. No maple syrup, honey, agave nectar, Splenda, Equal, Nutrasweet, xylitol, stevia, etc. Read your labels, because companies sneak sugar into products in all kinds of ways. 4. Do not eat processed foods. This includes protein shakes, pre-packaged snacks/meals, protein bars, milk substitutes, etc. 6. Do not eat grains. This includes (but is not limited to) wheat, rye, barley, millet, oats, corn, rice, sprouted grains and all of those gluten-free pseudo-grains like quinoa. (Yes, we said corn!) This also includes all the ways we add wheat, corn and rice into our foods in the form of bran, germ, starch and so on. Again, read your labels. 7. Do not eat legumes. This includes beans (black, kidney, lima, etc. ), peas, lentils, and peanuts or peanut butter. This also includes all forms of soy – soy sauce, miso, tofu, tempeh, edamame, and all the ways we sneak soy into foods (like lecithin). 8. Do not eat dairy. This includes all cow, goat or sheep’s milk, cream, butter, cheese, yogurt, whey, ice cream, etc. 9. Do not eat white potatoes. It’s arbitrary, but they are carbohydrate-dense and nutrient poor, and also a nightshade. 10. Most importantly… do not try to shove your old, unhealthy diet into a shiny new Paleo mold. This means no “Paleo-fying” less-than-healthy recipes – no “Paleo” pancakes, “Paleo” pizza, “Paleo” fudge or “Paleo” ice cream. Don’t mimic poor food choices! 11. One last and final rule. You are not allowed to step on the scale for the duration of your program. This is about so much more than just weight loss, and to focus only on your body composition means you’ll miss out on the most dramatic (and lifelong) benefits this plan has to offer. Give yourself a well-deserved, long overdue break from fixating on that number on the scale! Absolutely NO weighing yourself or taking comparative measurements during your program. A few concessions, based on our experience, and those of our clients. These are less than optimal foods that we are okay with you including during your challenge. Including these foods in moderation should not negatively impact the results of your program. 1. Fruit juice as a sweetener. Some products will use orange or apple juice as a sweetener. We have to draw the line somewhere, so we’re okay with a small amount of fruit juice as an added ingredient during your Whole30… but this doesn’t mean a cup of fruit juice is okay! 3. Certain legumes. We’re fine with green beans, sugar snap peas and snow peas. While they’re technically a legume, they’re far more “pod” than “bean”, and we want you to eat your greens. 4. Processed goods. We’re okay with cans or jars of olives, coconut milk, sauces and spice mixtures like tomato sauce or curry, or vegetables like sweet potato or butternut squash, but only if the labels prove they’re “clean”. The only way this will work is if you give it the full thirty days, no cheats, slips or special occasions. This isn’t playing the tough guy. This is a FACT, born of education and experience. You need such a small amount of any of these inflammatory foods to break the healing cycle – one bite of a friend’s pizza, one splash of milk in your coffee, one lick of the spoon mixing the cake batter within the 30 day period and you’ve broken the “reset” button. You must commit to the full program, exactly as written. Anything less and we make no claims as to your results, or the chances of your success. Anything less and you are selling yourself – and your potential results – short. It’s only 30 days. It’s For Your Own Good Here comes the tough love. This is for those of you who are considering taking on this life-changing month, but aren’t sure you can actually pull it off, cheat free, for a full 30 days. This is for the people who have tried this before, but who “slipped” or “fell off the wagon” or “just HAD to eat (fill in food here) because of this (fill in event here)”. This is for you. 1. It is not hard. Don’t you dare tell us this is hard. Giving up heroin is hard. Beating cancer is hard. Drinking your coffee black. Is. Not. Hard. You won’t get any coddling, and you won’t get any sympathy for your “struggles”. YOU HAVE NO EXCUSE not to complete the program as written. It’s only thirty days, and it’s for the most important cause on earth – the only physical body you will ever have in this lifetime. 2. Don’t even consider the possibility of a “slip”. Unless you physically tripped and your face landed in a box of donuts, there is no “slip”. You make a choice to eat something of poor quality. It is always a choice, so do not phrase it as if you had an accident. Commit to the program, 100%, for the full 30 days, and don’t give yourself an excuse to fail before you’ve even started. 3. You never, ever, ever HAVE to eat anything you don’t want to eat. You’re all big boys and girls. Toughen up. Learn to say no (or make your Mom proud and say, “No, thank you”). Learn to stick up for yourself. Just because it’s your sister’s birthday, or your best friend’s wedding, or your company picnic does not mean you have to eat anything. It’s always a choice, and we would hope that you stopped succumbing to peer pressure in 7th grade.